Nothing but insanity from here on out. Far Cry 4 has possessed a fairly robust Map Editor since it launched back in November of last year. Of course, if you were dedicated solely to co-op play, you may never have noticed this little entry on the main menu. Editorial tools such as these largely square themselves in the "PvP zone," so you and your friends can forge maps to blow each other up. FC4's Map Editor, however, lets you craft your own outposts, no matter how bizarre, strategically absurd, or architecturally unsound they may be, and take them out, all lone soldier style. Until now. 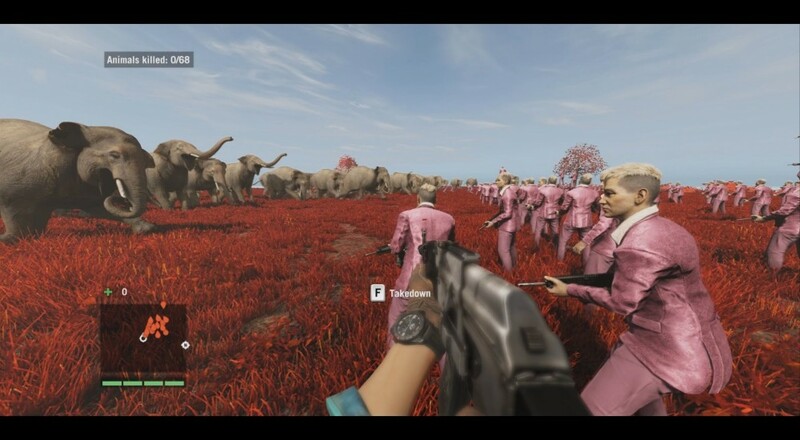 Finally, the fruits of Far Cry 4's Map Editor can be played co-op. You no longer need to rely on Ubisoft's guiding hand to tell you what you need to raid and free from Pagan Min's forces. If you and your partner have already salvaged all of Kyrat's strongholds, why not whip up some crazy bases and try to take them on yourself? Here's the initial trailer, before they implemented the co-op. If you haven't messed around with the Map Editor just yet, allow me to explain. You can craft terrain and structures, populating it with whatever or whoever you want, surrounded by a central mission objective. You can build the world's most fortified outpost, manned with a hundred heavy troopers and snipers at every point. You could craft the world's most lackadaisically guarded base, protected by a single sleeping soldier, who somehow trapped himself under seven ATVs. You can build tons of crazy bases populated with nothing but over-curious monkeys strapped with tons of C4, and the objective is "kill all animals with a flame thrower." Sometimes it's up to us to make our own fun, and the Map Editor gives us that option. If you and your partner have completely liberated all of Kyrat from Pagan Min's grip, why not slip back in and try to up the craziness factor? Page created in 0.2729 seconds.